WINNERS: The Czech Republic is unstoppable, once again. On Saturday, Petra Kvitova swept aside Kristina Mladenovic 6-3 6-4. Then Lucie Safarova — who has been so impressive over the past two and half years and rarely panics at the Fed Cup — overcame Caroline Garcia 4-6 7-6(1) 6-1. Kvitova, who hasn’t played since February, beat Garcia 6-4, 6-4 to win the tie 3-0 over France on Sunday. The Czechs beat Germany in the final at Prague last year over Angelique Kerber and Andrea Petkovic; they beat Serbia in Prague in 2011 over Ana Ivanovic and Jelena Jankovic; they beat Russia 3-2 in the final 2010 in Moscow over Svetlana Kuznetsova and Maria Kirilenko, among others. Now the Czechs will play the final again, this time against Russia once again and presumably, in Prague. Do Kvitova and Safarova want a piece against Maria Sharapova? You bet they do. LOSERS: Caroline Garcia has improved quite a bit this year but she has to be more patient and not go for winners immediately. She will in time. The Germans thought it a had a real chance to take down the Russians after Sharapova pulled out, but they couldn’t do it when. in the fifth rubber, the excellent doubles player Elena Vesnina and Anastasia Pavlyuchenkova wiped out Andrea Petkovic and Sabine Lisicki in straight sets. Captain Barbara Rittner had so many different choices. She said that Kerber, who had won Charleston last week, was too tired and didn’t arrive until Wednesday so she needed to rest. Petkovic, who made it into the semifinals, was also tired and hurt. But they had five days before Saturday, so if they were OK, why not just put them on Saturday? At the Grand Slams, you have one day off, and then you are ready to play again. Unless you are injured, that’s fine, but if they are OK, then go with it. That is why they are the main competitors. However, Rittner felt that Julia Goerges has been good at times on the clay and Lisicki had been played well at Indian Wells and Miami. But they both lost to Svetlana Kuznetsova and Pavlyuchenkova and then Germany was in serious trouble. But whoops, Petkovic and Kerber were ready on Sunday, they destroyed Kuznetsova and Pavlyuchenkova and they were ready to grab the tie. But hold on. Rittner decided to use Petkovic and Lisicki instead of trying Goerges, but Lisicki grew nervous and wasn’t listening, while Petkovic began to get frustrated. Vesnina knew exactly where she should be and what she would do and Russia won it. Props for the captain Anastasia Myskina, who talked to the team and calmed them down at 2-2. You can guarantee that she will want Sharapova to be the leader in the final. LOSERS: Rittner paid and they lost and that was painful. But her team has stuck in there and they have to give her another chance in 2016. Serena Williams did not play spectacular in singles by beating Camila Giorgi and Sara Errani, but in the fifth rubber, she and Alison Riske lost 6-0 6-3 to Errani and Flavia Pennetta. Props to Errani and Pennetta who really know how to mix in their shots, but Serena and Riske weren’t very enthusiastic. LOSERS: The younger girls still have a lot to learn, including Riske, Lauren Davis and Christina McHale who lost very quickly and quietly. Crazy days, that is for sure. Aga Radwanska comes out firing and beats Martina Hingis 6-4 6-0, her best match all year, even though the former No. 1 hasn’t played singles in eight years. The Swiss Timea Bacsinszky has played very well over the past two months, and she whacked Urszula Radwanska 6-2 6-1. But then Bacsinszky smoked Radwanska 6-1 6-1. That was stunning. Hingis surpisingly fell to Urszula 4-6 7-5 6-1. Back in the day, Hingis would play for hours and never looked tired. Now at the age of 34, she looks terrific moving around in the doubles, but on singles, she is not as fast. But getting tired after a couple of hours? She must have been super nervous inside, because there is no reason that her legs were heavy. Whatever the case, Hingis didn’t play the doubles because she couldn’t run anymore, but Bacsinszky was gutsy again, playing with Viktorija Golubic and they beat Aga and Alicja Rosolska 2-6 6-4 9-7. LOSES: Without question, Aga Radwanska has been reeling, losing to everyone and everything this year. Losing easily at home against Bacsinszky — who has played lights out – by the once former Wimbledon final shows that she is very confused. Good for Genie Bouchard who changed her mind and came to Montreal. However, she is really slumping, losing both matches to Alexandra Dulgheru and Andreea Mitu, a real unknown. But, the tennis world knows her now. The top Romanian’s Irina-Camelia Begu couldn’t even play on Sunday because she was hurt (she beat Francoise Abanda on Saturday). Credit to all the players who won as there No. 2 Simona Halep couldn’t make it. LOSSES: Bouchard has lost her rhythm, but she took a big hit by not shaking hands with Dulgheru at the tie. People will talk about it all year long, or until she retires. It looked like Australia would win easily, but Sam Stosur was hurt and couldn’t play. The Netherlands played as well as they could, with Kiki Bertens winning two matches, beating Jarmila Gajdosova and Casey Dellacqua, while Arantxa Rus grabbed one over Gajdosova 0-6 7-5 7-5 to end it. Props to the captain, the former ATP pro Paul Haarhuis, who gave them self belief. 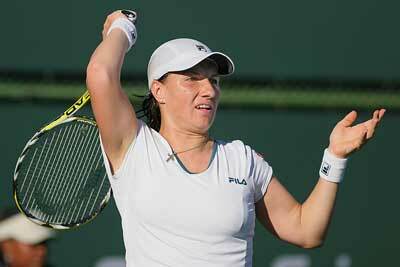 LOSSES: Gajdosova should have been able to best Rus, who is ranked at No. 217.